Why is godello so pleased? #grenache @Wine_Australia @vintageMD and @Caplansky that’s why. Mark Davidson, that’s why. 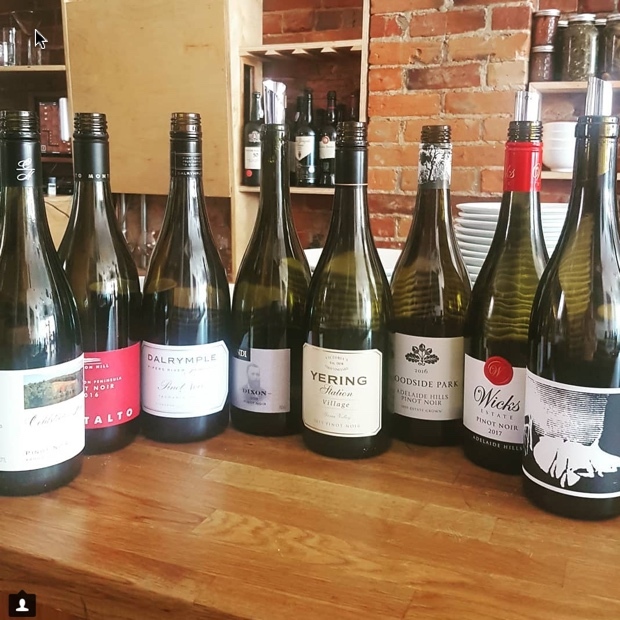 We taste Australian wines with thanks to the intrepid Wine Australia ambassador, traveller and purveyor of everything you could ever want to know about that country’s wine scene. 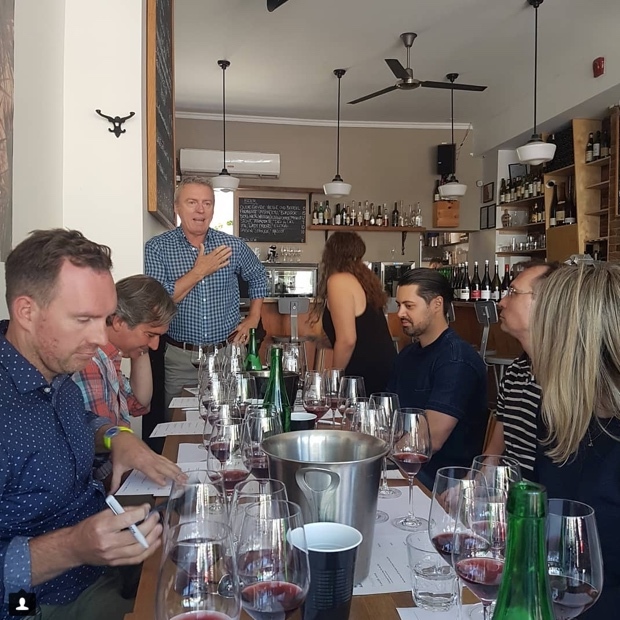 Davidson passes through our Toronto parts on manifold missions each calendar year and graces our collective wine writer-meets sommelier soul with non bottle-o Aussie bounty, not oft tasted before. In mutual abide our local agents are always willing to throw some gems into Mark’s mix and our finest restos lay out the food-matching compliments to accede the most excellent of wine tasting gatherings. The last three sessions took place in June 2018, February 2018 and September 2017. For that September get together we convened at Caplansky’s Deli for a Smoked Meat and Grenache Lunch. “Pastrami to me smells like grenache,” says Davidson in candid equation. “Drink some and eat some meat.” In 2015 there were 1500 hectares of the varietal under vine, this compared to 44,000 of shiraz. On its agriculture in Australia he added “if you leave it untended it will go blowsy and slutty.” What about wood? “I don’t think new oak works with grenache. It dominates it.” These are my notes on the eight wines. This one’s for their kids’ grandfather, Grandpa Antony, a grenache sourced from the best corners of their McLaren Vale Foreman block and Blewitt Springs Genovese Vineyard. The James Erskine and Fiona Wood “keep me satisfied, please keep me calm, keep me pacified” grenache. Renders sulphur and volatility into must with magic and preservation. Old plantings (to the 1970s) offer the prospect of a whole cluster, 40 days on skins raising. It smells and tastes like the scrapings and peelings of plums, peaches, apples, cherry and cranberry. The concentration factor is spiked by anise and tonic bitters, working out the kinks and comfortably leaving an aftertaste of pure finessed liqueur. There is no question in my mind that of the two, Gramp Ant is not merely superior to Like Raindrops but is so much more fun to drink. From thirst to appetite. “Sitting by the riverside.” Drink 2019-2025. Tasted September 2017 jaumawines thelivingvine @JaumaWines @TheLivingVine James Danby Erskine The Living Vine inc.
A different look for Australian reds and connective with Tool’s James Maynard Keenan but if Post-Punk, Prog-Rock grenache is what you’re after than this Tolken Silmarillion Fugazi is the one for you. Its fruit spent 80 days on skins and the resulting whole bunch umami resides in an MDMA-Ecstasy-Fugazi realm. Clean, pure and of a transparency that speaks to the realism of the dream. It’s bloody juicy and anything but messed up beyond recognition. In fact it speaks to the opposite of the nomenclature. “Do you realize, this world is totally fugazi?” Great wines like these are the head, the voice and the heart. Maybe even the prophet, the visionary, the poet and the sentimental mercenary. Drink 2017-2022. Tasted September 2017 ochotabarrels thelivingvine #OchotaBarrels @TheLivingVine @Ochota Barrels The Living Vine inc. 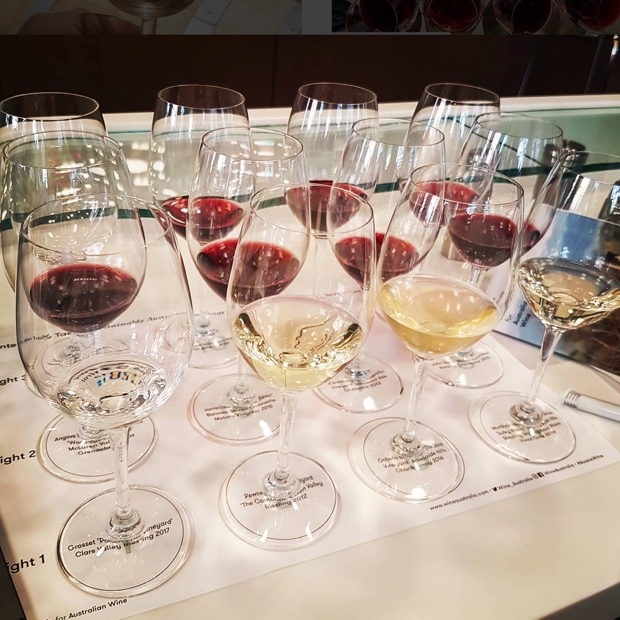 In February 2018 Mark hosted a tasting of 12 (mostly) alternative varietals at George Brown College. It began with the Clare Valley, once a massive mountain range, now an extension of the loft mountain ranges and just shy of a great outback. It’s an amazing micro-climate with huge diurnal temperature changes, It can be 40 degrees during the day in peak growing season and five at night. “There is dew and there is this revival process that happens with riesling.” Here are the notes. Chardonnay out of the Stint Vineyard is from Lenswood in the hills in surround of Adelaide, up to elevations of almost 600 metres. It’s really about site exposure, and undulations, but to be honest it does little at first to tell me that is noses as chardonnay because there is a layer of impregnable wax and forest wall. Impenetrable because it’s so verdant, equally distributable and obscured by clouds. Picked on acid, as in profile, not elevation, cloudy because of no filtration. Likely 20 year-old fruit and if you consider this as funk you’ve not quite been listening to the right beats. The funk will only get better. Ochota Barrels repping the Basket Range Collective with a side of Rolling Stones. Drink 2019-2024. Tasted February 2018 ochotabarrels thelivingvine #OchotaBarrels @TheLivingVine @Ochota Barrels The Living Vine inc.
Part of the amphoric project of Brad Hickey, raised in 200L amphorae, the volatility is but a whisper, way more calculated than careless. A full come about turn away from the previous Riverland Graciano this digs deep into the soil for a funky nero d’avola, far away from the caky Sicilian style and now under the auspices of perspiring glands. It’s not nearly as dense and intense you’d think it might be, nor is it so very varietally obvious, but it’s level of intrigue meeting with the need to get in my mouth is the stuff of lyrical innocence inspiration. Nero, nero on the wall, who’s the coolest Vale of all? Drink 2019-2026. Tasted February 2018 brashhiggins thelivingvine @BrashHiggins @TheLivingVine @BrashHigginsWine The Living Vine inc. 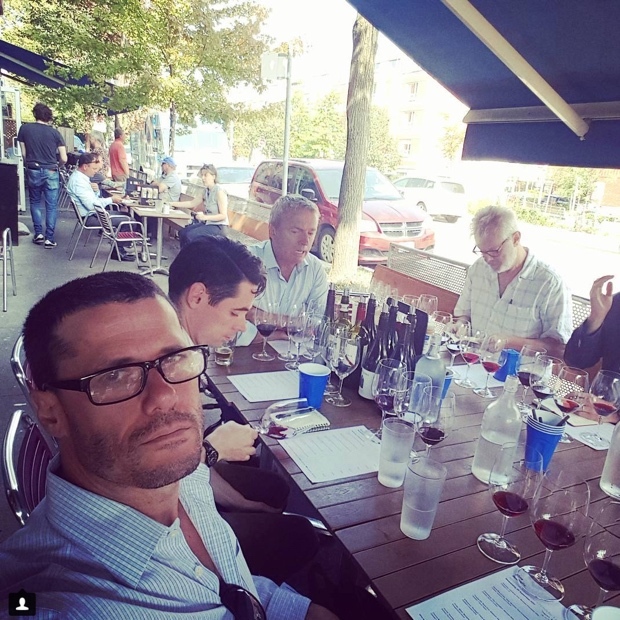 In June of 2018 we connected with Mark once again, this time at Archive Wine Bar for pinot noir and porchetta. We travelled through eight from the 2015 and 2016 vintages. Impeccable disorder or as I like to call it conventional dysfunction. It’s a late picked pinot noir from one of winemaker Taras’ cooler sights, not so much a regional Piccadilly snapshot as much as realistic dystopian universality. Lifted volatility, pure orange juice and whole bunch pressing add up to wild rides through a flat earth. It’s like seeing things in 3D without glasses or drugs. It’s filmmaking in a glass and it tastes like pinot noir should, not as it does. Wrapped so tight, chewy, chalky and its own tonic-twisted, shaken and stirred cocktail in a glass. Drink 2020-2028. 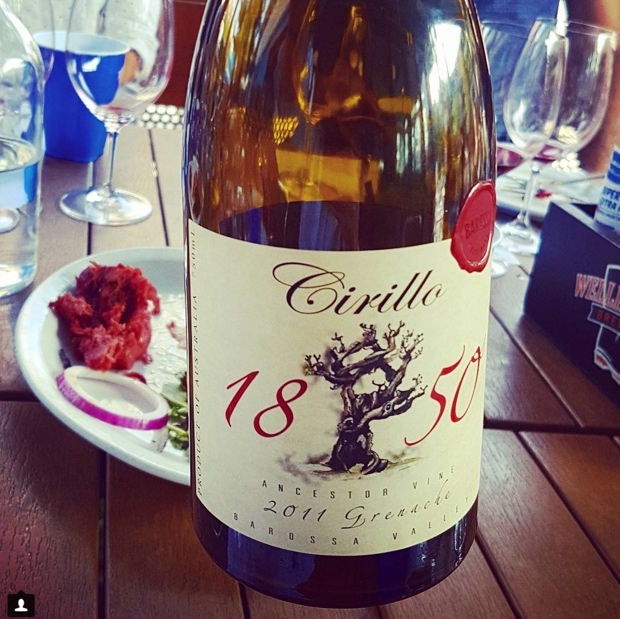 Tasted June 2018 ochotabarrels thelivingvine #OchotaBarrels @TheLivingVine The Living Vine inc.